Africa’s top two ranked teams put up impressive performances to beat their respective opponents on match day four(4). The race to lift this year’s Africa Nation Cup continued as South Africa and Ghana beat Host Egypt and Nigeria respectively. Defending Champions South Africa beat Host Egypt by 11-0 in the first match of the day to secure a place in the final with a game to spare. The Host, after losing by 6-0 to Ghana yesterday, were assured of another heavy loss at the hands of the South Africa as Skipper Sulette Damons put the Champions ahead in the 5th minute before Chamberlain Dirkie added a second in the 10th minute. Van Jaarsveldt scored in the 13th minute to make it three(3) for South Africa before 1st quarter ended. Bobbs got her name on the score sheet in the 25th minute to make it 4-0. Baxter increased the tally in the 35th minute before Chamberlain grabbed her brace in the 38th minute to make it 6-0. The game was beyond the reach of Egypt when Du Plesis scored her first in the 41st minute with Damons grabbing her brace in the 45th minute to make it 9-0. Chamberlain scored two goals in the 48th minute before Du Plesis rounded up with her 2nd in the 59th minute to send the Champions into their 7th consecutive final. 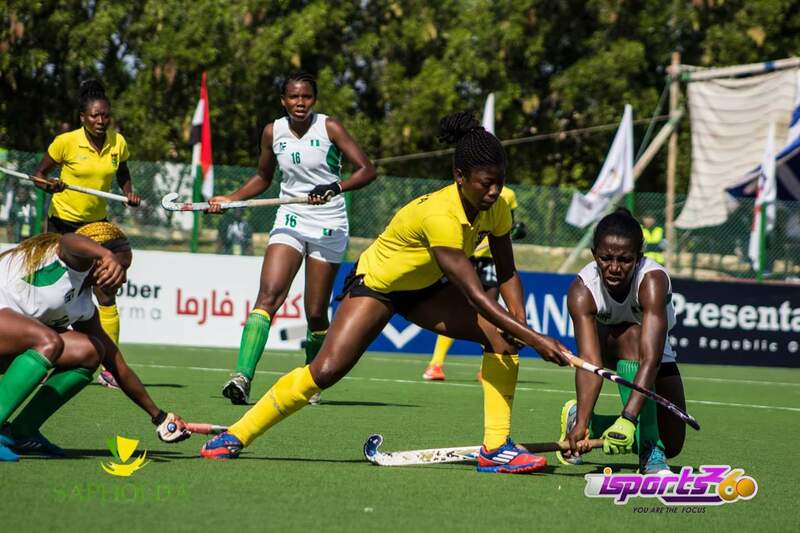 It was an all West African affair as Ghana’s black sticks locked horns with the greens of Nigeria in the women’s second game. The Ghanaians needed a win to secure a place in the final while the Nigerians were in a fight for the 3rd place match should they win. The 1st two quarters proved so tensed as both teams set out a defensive display to deny the other a goal. The Ghanaians who needed a win to increase their chance of qualifying for next years world cup, drew first blood through Lydia Afriyie in the 33rd minute. The tempo of the game changed after the goal as the Black Sticks mounted pressure to add a 2nd and cement their lead but the defence of the Nigerians were equally up to the task and make sure that Afriyie’s 33rd minute strike was all they will concede. The game ended with Ghana narrowly beating Nigeria to set up a cagey final with South Africa. South Africa and Ghana with wins today sit top of the table with 9 points each and secure a place in the final. Kenya come in 3rd with 3 points with Nigeria 4th with a point. Host Egypt after conceding 17 goals in 2 games stay at the bottom also with a point.